At this time of year, we strive to come up with just the right gift for each young person on our list, hoping these books will go on to be perennial favorites. We hope the 20 titles reviewed below will help. 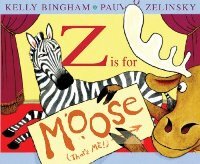 Speaking of favorites, we had a chance to sit down with Kelly Bingham and Paul O. Zelinsky, the imaginative minds behind Z Is for Moose and this year's Circle Square Moose. Bingham got the idea for Z Is for Moose while working as a storyboard artist and director for Walt Disney Feature Animation. She sat in on a casting audition one day, and heard the directors say "great job" to the actor, then "We don't want that guy" to each other. That experience, combined with a writing teacher who discussed metafiction, and a three-year-old son learning his ABCs, gave Bingham the inspiration for a story starring an animal who mistakenly believes he got the part and is waiting his turn, impatiently, to perform onstage. "At first Mouse was going to get the part," Bingham admits, "but Moose was funnier." As the illustrator, Zelinsky said, "I had to approach it like a math problem: 32 pages and 26 letters." (Luckily, his father is a math professor.) He had to think: "If F is on the left, and G is on the right, what does that do to Y and Z?" For their first book together, they worked separately, relying on their editor, Virginia Duncan, to meld their contributions into a unified whole. 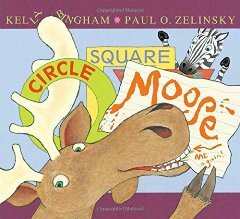 They used a more collaborative process for Circle Square Moose. Bingham said she was having trouble "finding my footing." Then Zelinsky took Bingham's text, mapped it out as a book dummy, and sent it to Duncan. Once Bingham saw the dummy, she knew where she needed to do the work. This poetic book from a debut author will help youngsters wind down at the end of the day as nocturnal colored-pencil illustrations take them on a tour of nature's denizens heading to bed. Discover: A bedtime book that features nature's creatures winding down for the night. Telephone is an excellent example of a perfect marriage between text and artwork. Shadowy birds sit on a wire above a neighborhood scene of children playing outside. Mother bird asks a cardinal to tell her son, Peter, to "Fly home for dinner." The cardinal, holding a baseball bat, asks the goose next to him to "Tell Peter: Hit pop flies and homers." And so it goes, each bird mangling the message for the next. Finally, the wise old owl deciphers the message and tells Peter to head home for supper. Mac Barnett (Battle Bunny), known for his engaging, often zany stories, takes a familiar childhood game to heights only he could imagine. Jen Corace (Little Pea) skillfully weaves small, delightful details into every bird's portrait, offering hints at the garbled message each will deliver. This picture book will be read over and over, as youngsters pore over every spread to guess what comes next. --Cathy Berner, Blue Willow Bookshop, Houston, Tex. Discover: A familiar game of telephone starring birds on a wire, enhanced by artwork that hints at their garbled messages. New York City is hard enough for adult-sized humans, let alone little elephants. That won't stop Little Elliot, a tiny elephant covered in pastel polka dots, from trying to make it work. He's figured out how to get around the city despite his size, but is still stymied by one goal: buying a cupcake. When he helps an even tinier friend and then his new friend helps him, he realizes that teamwork is the key to happiness in the big city. Discover: A charming picture book perfect for city kids and cupcake fans. Preschoolers will clamor for this tour of the hamster hero's workplace and a glimpse of his daily routine. The padded rectangular package--with thick black outlines of hammers, wrenches, motor oil and more, filled with crayon-bright colors--will invite repeated readings. Discover: An insider's view of a busy garage just right for preschoolers. Have you ever mixed gingerbread dough? And smelled the cookies baking? In Catch that Cookie! Hallie Durand (Dessert First) delivers an inspired interpretation of the classic tale about the runaway cookie. Discover: A twist on the classic Gingerbread Man tale, in which Marshall and his classmates hunt down the G-men. Maya Christina Gonzales (My Colors, My World/Mis colores, mi mundo) smoothly integrates the metaphor of a tree and a child in this bilingual text and radiant artwork, as they grow into tall, strong stewards of life on earth. Discover: A meditation for youngest children on our relationship with nature. This book of fantastical birds is sure to delight budding bird watchers and future ornithologists. Discover: A fantastical catalog of mix-and-match options for bird lovers to invent their own future species. Kid Presidents, a subtle parody of a textbook, opens by debunking the cherry tree myth tied to George Washington's childhood and never lets up. Discover: The perfect gift for both presidential and history buffs, brimming with fun facts and full-color, comics-style artwork. This oversize volume does not have to beg to be opened. It invites readers into a natural history museum where the species are curated, categorized and presented in six visual "galleries." Discover: A museum in a book, with spectacular colored pen-and-ink drawings, presented in an elegant 11"x15" volume. In a world where only the strongest and bravest get to be princesses, what Evie most excels at is incompetence. Despite escaping from a horrible witch and helping to save handsome Prince Remington, Evie still has no idea who she is or where she comes from. All she knows is that she must survive her training at Pennyroyal Academy. It's where today's "bold, courageous youths" learn to become "tomorrow's princesses and knights." But poor Evie is clumsy. She can't remember the fairy tales, and she keeps passing out from strange visions. Nobody thinks she is proper princess material. Ultimately, Evie must learn to believe in herself, and call upon all of her courage and compassion, if she is to have any hope of making it out alive. Discover: An exciting fairy tale mash-up, wherein princesses and knights learn how to keep the world safe from witches. Soccer and the politics of Soviet Russia dominate in Arcady's Goal, the latest novel from Newbery Honor author Eugene Yelchin (Breaking Stalin's Nose). Narrator Arcady is 12 years old and, according to the government, a "socially dangerous element": a child of enemies of the people. Soccer keeps Arcady alive--the risk, the thrill and his natural skill. His life takes an abrupt turn when the oddly mysterious Ivan Ivanych sees him play and decides to adopt him. Could Ivan be the one to help Arcady find a way to become a real soccer player? Discover: An orphaned boy dreams of soccer stardom in Soviet Russia. Mysti Murphy is astonishingly well-adjusted for a seventh-grader who's not only dealing with an agoraphobic mother, but also a best friend who's running a social experiment that includes not talking to her in school. That changes after her father has an accident, upsetting the delicate balance of life in the Murphy household. Though she likes to picture herself as a character in a book, Mysti now needs to step into the real world to develop new skills in order to get through the next few months. Discover: Another spectacular middle-grade novel from Karen Harrington that will suit almost any chapter book reader. This satisfying middle-grade mystery features a colorful cast of characters and their even more colorful secrets. The creaky old Greenglass House, known as an inn for smugglers, is usually quiet over Christmas break, but a storm ensures that, this year, there's "no vacancy"--it's full of eccentric characters. The innkeepers' adopted son, Milo, wishes he could have his parents to himself, especially when they enlist their cook's help in serving the houseful, and young Meddy tags along. Soon, however, Milo and Meddy find themselves in the middle of the guests' secrets and mysteries, such as items gone missing, and the true motives for their stay. Discover: A satisfying mystery with a colorful cast of characters and their even more colorful secrets. In the meteor-scarred lands of the Merrow Kingdom, a 13-year-old scrapper named Piper longs to find a new life as a machinist in a big city. After a meteor shower destroys a caravan passing through town, Piper rescues a girl from the wreckage with no memory of who she is beyond her name, Anna. Their only clue is an elaborate dragonfly tattoo on her arm: the mark of the Dragonfly king. When a dangerous man comes looking for Anna, the two girls escape on a train and embark on a thrilling cross-country adventure. Discover: A sci-fi adventure starring two girls with rare gifts who run for their lives, toward unknown dangers and opportunities. If given the chance to chat with a squirrel, most of us would probably demand peace for our backyard bird feeder. But, as she explains in her authors' note, when Newbery Medalist Lynne Rae Perkins (Criss Cross) is approached by a chatty squirrel on a park bench the conversation turns to more interesting lore. Jed, a squirrel, is plucked from his forest home one day by a hawk with a not-so-firm grip and, "like the great Houdini escaping a straitjacket," manages to break free. Now stranded among squirrels who have their own slang, customs and exotic cuisine (pine cones), Jed realizes he may never make it home. Chai and TsTs (so common, it's "the 'Emma' of squirrel names") follow him, and what they discover will forever change their lives. With references to YouTube, tips on squirrel style, plus the author's own illustrations and plenty of witty footnotes scattered throughout, Nuts to You will satisfy the animal advocate in your life who's curious about what happens beyond their proverbial tree. --Molly Magro, librarian, Eyer Middle School, Macungie, Pa. Discover: A forest-based folktale for anyone with wanderlust, a "nutty" sense of humor and perhaps a soft spot for squirrels. This dark, haunting tale opens with the death of one of Sister Witch's twin sons, and village whispers that "the wrong boy" survived. Discover: A darkly magical tale of a witch's son, a bandit's daughter and a wolf destined to change the fate of a kingdom. Lauren Magaziner soars onto the scene with a story that has echoes of the classics but is completely original. In the coastal witch town of Gliverstoll, 11-year-old Rupert Campbell often finds himself on the receiving end of his fifth grade teacher Mrs. Frabbleknacker's punishments. Her latest threat, to kick him to the witches' doorstep, doesn't seem so bad, especially since he's never met one. But when Rupert finds an ad in the newspaper for a witch's apprentice, he thinks it's "beyond perfect." Witchling Two needs help mastering her spells before her upcoming Bar Exam to become a full-fledged witch. If she fails, she'll be exiled forever. Discover: When a fifth-grader answers a young witch's ad for an apprentice, hilarity ensues. Eschewing the role of authority, in Eyes Wide Open: Going Behind the Environmental Headlines, Newbery Medalist Paul Fleischman (Joyful Noise) acts as a companion to teens in their quest to acquire the facts and arrive at their own convictions. "History is happening right here and right now," he writes, giving examples of the things teens have never lived without, and the tradeoffs that come with them. He explores technology and the fossil fuels that power them, as well as farming and agriculture, and how decisions about the use of finite resources make an impact on teens' lives. Discover: An attractively designed guide for teens to thinking deeply about their world and what they can do to shape it. With powerful language and complex characters, Jandy Nelson (The Sky Is Everywhere) delivers the story of twin siblings coming of age. Noah and Jude are as close as twins can get. Jude is always rescuing her awkward brother from bullying or worse. Noah is happy to have his art, his mom and his sister's devotion. He can live with his father's disapproval and his lack of social life. Jude is the teenage golden girl--carefree surfer, secret sculptor of sand figures and the object of most boys' desire. Fast forward three years: a terrible tragedy has alienated the siblings. Until they can find some way back to each other, neither can be whole. Discover: Give this to John Green fans clamoring for a smart, savvy writer who speaks their language. In diary entries, Gabi, an unforgettable narrator, describes her entire senior year at her Catholic high school in Southern California. She loves carne asada, her best friends Cindy and Sebastian, poetry and guys. Though at the beginning she's not yet been kissed, she makes up for it over the course of the book--as both initiator and recipient. Gabi's intelligence informs her sense of humor, and also her ability to see things with clear eyes, such as her father's drug addiction and the double standard behind people judging Cindy for getting pregnant while celebrating Gabi's mother's pregnancy. She loves Gwendolyn Brooks's "We Real Cool," Sandra Cisneros and Ginsberg's "Howl." She writes, "That's the magic of poetry--some gay Jewish poet wrote about people wasting away around him because of drugs, and I, a straight Mexican-American girl, know how he felt...."
Discover: A funny, insightful high school senior, and a debut author on the rise.